Until reading a post over at Mets Police today, I had never realized that the Brooklyn Dodgers “B” logo that appears on caps sold today is different from those generally found in photographs and on authentic, game-worn caps of that era. I left a comment on the post, but my curiosity wasn’t diminished. The bulk of the post comes from an e-mail sent to Mets Police in which the writer accuses the Dodgers, Mets and New Era of duping consumers into buying what he calls Bakersfield Dodgers caps, not Brooklyn Dodgers caps, citing the photos on baseball cards of Mike Piazza and Pedro Martinez from their Bakersfield days. Head on over to Mets Police to see those cards. Look at any Brooklyn Dodger photo, and you’ll never see a B like the one the LA Dodgers/New Era are peddling. Nor is it similar to the one the Franchise collection is selling, which is a Boston B with a triangle cut out. But it’s a carbon copy of the Bakersfield B. It’s clear from photos of the Brooklyn Dodgers that although there were varients [sic] of their logo, it was never like these. Me again. Now, it’s true that the Franchise Collection cap has a B very similar to Boston’s, something I’d never caught before, even though I have both clubs’ Franchise caps. (Yet I did manage to catch that UCLA’s on-field baseball caps use the Brooklyn Dodgers’ logo — and at a closer approximation to the ’50s design than today’s retail replicas.) 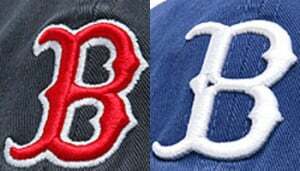 Here we have a comparison of the Franchise cap logos (on the left) and those from a current fitted Red Sox cap and a 1932 Dodgers cap (on the right). There are subtle differences to the point where it’s not literally a Boston B with a triangle cut out, but it’s easy to see where that comparison could be made. And so, using the logos found on Chris Creamer’s site (note that the Brooklyn one has a straight line, not a curved one), I superimposed one over the other. The sizing is a little different (though I tried to get the individual image sizes as close to one another as possible), but they’re definitely close enough to see a similarity. As for those Bakersfield caps? Well, they’re not exactly Boston B replicas, either. 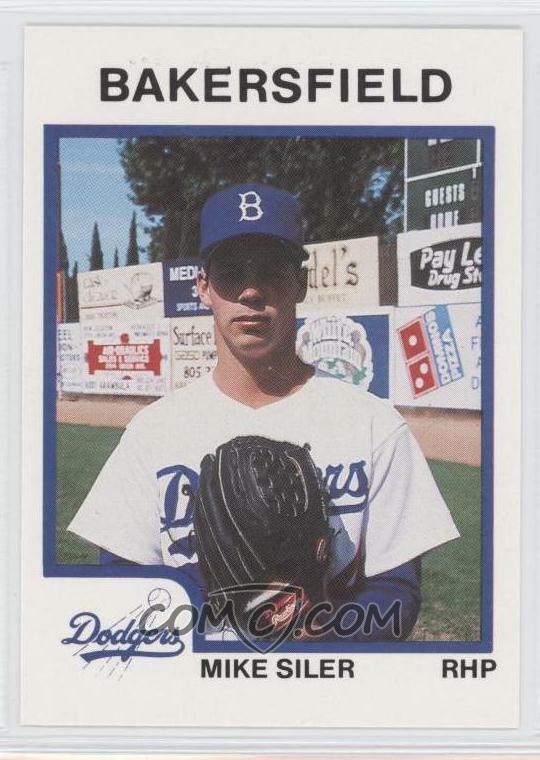 This card of Mike Siler, who was in Bakersfield in 1987, shows a cap logo much closer to Brooklyn’s B, with curves in the vertical line and rounder loops. So not even all Bakersfield caps are Bakersfield replicas, as it were. Now let’s go back in time to compare logos further. Next up are two sets of three cap logos from actual players’ lids. The first set are from three caps I’ve seen in person: Jackie Robinson’s in Cooperstown and Cookie Lavagetto’s and Sandy Koufax’s in a Dodgers display at the Brooklyn Cyclones’ Energy Company Park. This second set comes from Corbis photos of Frederick Fitzsimmons and Duke Snider and another view of Jackie’s cap in Cooperstown. Two things stand out in these comparisons. 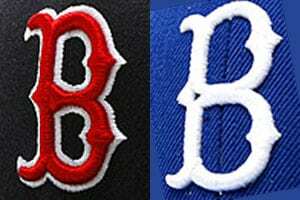 First, the Lavagetto cap (middle B in top series) looks quite similar to the logo produced on replicas today. Second, the three in the second series all show a much more rounded B, to the point that they look like numeral 8’s with embellishments added. That is clearly like nothing we see produced on today’s retail caps. But not all of the retail caps sport the Boston-like straight-lined B. This shot and this press release both show New Era caps with the curved vertical line and more rounded B. So what does this all mean? For one thing, I don’t think the Mets or Dodgers have anything to do with how the caps look. That’s up to New Era or whatever company is producing them. I wouldn’t be surprised if the only thing the Major League clubs really look over closely in order to give their approval pre-production are the designs that are worn on the field — uniforms and caps for games and batting practice. I also suspect that New Era (and any other companies that have licenses to produce them; for the sake of simplicity, let’s understand that “New Era” from here on out means any company that manufactures replica caps for retail sale) is merely working off of a template drawn from just one of several variations of Dodgers logos. Though the finished product might not look quite like what the Dodgers wore in the ’50s, it was probably designed from a logo not unlike what is on Creamer’s page. Plus, the different eras should be taken into account. Technology, materials and manufacturing methods are much different today than they were in the ’50s — that alone could account for some differences. Today, computerized machines likely play a part in New Era’s production line; back then, it was probably some company employee sitting at a machine to put the B on the Dodgers’ caps. Could all the manufacturers do a better job of reproducing the Brooklyn B on its retail caps? Sure. It’s done pretty well on some, so why not all? But I think there are many more likely answers to the differences in 1950s Brooklyn caps and today’s retail replicas before we get to a conspiracy on the part of any teams or New Era to hoodwink the fans. GREAT job. Did you have a look at the Brook,lyn Cyclones “B”? If anything, they get the Brooklyn “B” right. At least in my eyes. Thanks guys. And yes, Mark, I did look at the Cyclones’ B. They get it very right. Except that the Cyclones’ look is an absolute mess with the use of seemingly the entire color spectrum and the fact that the “C” does not match the “B” on their cap logo. Great research and column. Your comparison to a #8 clarifies things. Thing is, the New Era hat looks more Bakersfield to me, and it’s not a triangle in the cutout. It’s more like a four sided diamond. And furthermore, I don’t see any photo precedent from Brooklyn for the New Era design. Meanwhile, over at Cooperstown Collection, instead of a triangle cutout, so to speak, they’re actually sewing a blue triangle on to the white B. By the way Ross, thanks for the response. Even though the Dodgers and Giants have left NYC, to me, they’ll always be brothers of sorts. It’s like family that moves away. Getting a response from the Dodgers on this subject is a big deal, and a really nice thing. If you have any pull whatsoever with New Era so they could make a hat with any true Brooklyn B, you’ll have a lot of happy Brooklyn codgers out there. Take a spin sometime over at the Baseball Fever website, where the faithful congregate. Hmmmm… looking more closely at the photo reference, it seems we may have been using an incorrect version of the ‘B’ as well. I think it was always assumed it was a ‘diamond’ where the loops meet… but it seems to always be a triangle. 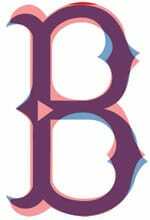 I am going to look through more of our archives to make sure, but if that’s the case we will definitely modify our Brooklyn ‘B’ artwork to be as faithful as possible to the original(s). Greg, I definitely do lurk quite a bit on the Baseball Fever boards, both in the Los Angeles and Brooklyn threads. We try to be in touch with our Brooklyn past as much as possible. Ross, I wanted to thank you for commenting in the first place and then for following up. I have to say I’m surprised that there was as much behind this little exercise as there turned out to be. Dan, this is the type of thing that keeps me up at night! Hahaha… In my line of work there is NEVER a detail too small to pay attention to. The goal is to GET IT RIGHT— exactly right, if at all possible. I found your blog by clicking a link from UniWatchblog.com. Know that we will strive to get this right and keep fighting the good fight with MLB and its licensees! Nice Blog. Thank you for sharing and I want to share information about the Mitchell and Ness Hats collection from CraniumFitteds online store, including Mitchell and Ness Snapback Hats, Fitted Hats, Jackets, New Era Caps, T-shirts and more. I have always thought that the B on the Brooklyn hat could easily be converted into a Dodgers D for there away uniform. Kind of overkill to have Los Angeles across their chest, LA on their hats and left sleeves. A Brooklyn style D would look good. As would the Dodgers baseball logo on the sleeve, instead on the LA. So a great topic, I like both the Bakersfield and the Brooklyn designs.. I pay homage to both hats and towns. My GGGG grandmother was from New Amsterdam, lived there in 1680, her name was Van Breuckelen, she immigrated from Holland from the city of Breuckelen. That is how we get the Borough of Brooklyn, NY. I have lived all of my life just north of Bakersfield, so that hat represents both eras for me. Sadly today, 8/28/2016 is the last seasonal game for the Bakersfield team at Sam Lynn Ballpark. Hopefully the future can bring a new ballpark and the Triple A affiliate from Oklahoma to California and be closer to the home club. It is only 89 miles to Dodger Stadium. A lot of greats passed through the Bakersfield ballpark. Years ago the Giants were affiliated with the Fresno Class A team, the Mets were in Visalia, the Dodgers in Bakersfield and the A’s in Modesto. Seen many many of the greats in their beginnings or in a rehab situation,,,, Glad they still make the hats, I wear em!!! !